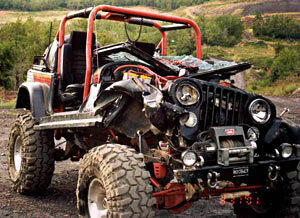 If you’ve ever run trails like Snake Pit, Green Mamba, Jeff’s Ledges, or Wet N’ Wild near Clayton, Oklahoma, I know you’ll appreciate the need for protection - differential cover protection, that is! These photos of Steve Snyder show what I mean. This could have easily been a very expensive situation. 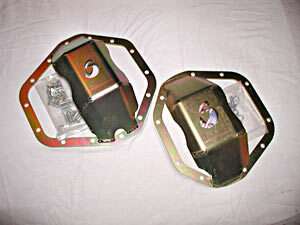 Fortunately, that big rock didn’t punch a hole in his stock diff cover – this time! Not exclusive to trails that are many times covered by several feet of water in places, differential cover damage can really ruin your day, as the resulting potential for fluid loss and expensive internal damage can be a major pain! While quite a few manufacturers offer some sort of differential protectors, from complete replacement covers to guards that bolt just to the lower half of the cover area, respected suspension company Superlift has jumped into the fray with an attractive alternative, at a very reasonable price! Constructed from laser-cut 3/16” plate steel, Superlift’s eXtreme Rings seem to be a very affordable compromise between expensive full-cover replacements and the bolt-on guards. The advantage of a full-cover replacement is that it protects 100% of the differential cover area, but usually at a significant price. The guards are less expense, but cover maybe only the bottom 1/3 or ½ of the cover area. They also usually stick out further, many times creating issues with steering linkage on the front, or gas tank clearance on the rear. The eXtreme Ring bolts around the entire circumference of the cover area, reinforcing the lip area, and protecting the area of the differential most likely to come into contact with foreign objects, i.e. rocks! They are also finished in a yellow/gold zinc-chromate to help deter rust. As you may have guessed, installation of the eXtreme Rings is fairly straight forward. However, as pointed out in the installation instructions, there are a couple of pointers that will save some time and hassle, so read them first. The older I get, the more I tend to read instructions before starting work! 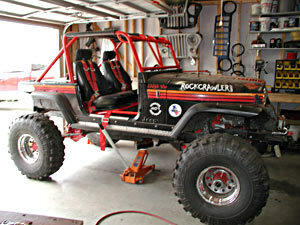 We’re going to install these rings on my 1977 Jeep CJ-7 aka “Déjà Vu.” Some of you may remember this Jeep. It suffered a bad rollover about 5 years ago, was rebuilt within several months, and then wheeled for a couple of years. 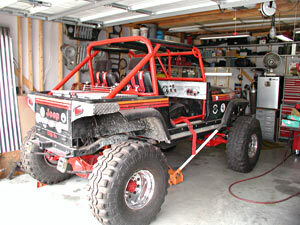 Two years ago, I built another CJ-7 using the suspension and Dana 44 axles from Déjà Vu, with plans to go “bigger.” Finally, after many delays for various reasons, it’s running again (or will be by time you read this), with a Dana 60 front differential and a Corporate 14 bolt rear diff. As you can see, I’m running a spring-over suspension for now, using some YJ leaf springs with an extra leaf or two to give me a little more lift to clear the 38” Super Swamper radials. With high clearance steering arms sitting on top of the D60 knuckles, I’ve eliminated just about everything that could get hung up under there, except the diffs themselves! 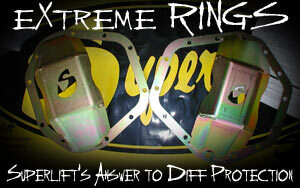 That’s where the Superlift eXtreme Rings come in. all the way through to the inside of the housing. If this is the case, I’d suggest you go ahead and drain the gear oil, clean up the mounting surface, and reseal the cover using a good RTV sealant. Otherwise, your chances of developing a leak are quite high. 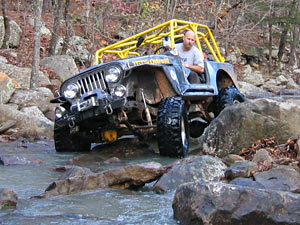 If your rig is in need of differential maintenance, now’s a good time to do it, anyway. One of the first steps in the installation procedure recommends you “test-fit” the eXtreme Rings, making sure the bolt holes line up properly, etc.. Good idea, but here’s where I ran into a little snag. 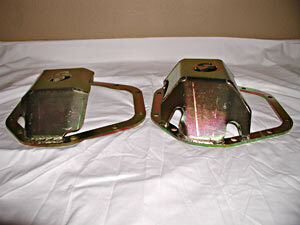 Apparently, one Dana 60 differential cover is not necessarily the same as the next one. 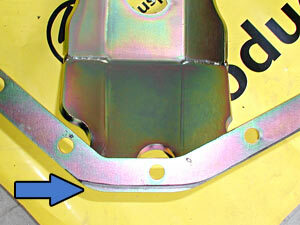 The bolt holes line up, but the depth of the cover may be different, depending on the application. In talking with the folks at Superlift, I just told them I needed a 14 Bolt and a Dana 60 eXtreme Ring, which is exactly what they sent me. 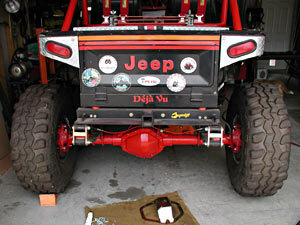 However, I quickly found out that the Dana 60 Ring wasn’t deep enough! A quick call to Superlift revealed the error, and the correct one was on the way. 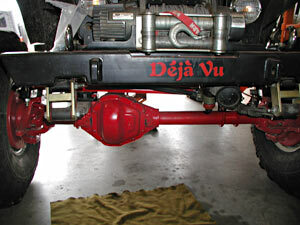 After some research, it was determined that there are at least 2 variations of Dana 60 diff covers, and probably more. A couple of quick measurements will help. The first eXtreme Ring I received had a depth of 2 9/16”. The second one measures 3 ¼”. (see photo below/left) Either way, just pick up the phone and tell Superlift what you have and they’ll get you straightened out in no time!